Disclosure: I received a free copy of the DVD Becoming Myself to facilitate my honest review. No monetary compensation was received. All opinions stated are mine and were in no way influenced by receiving this Bible Study at no charge. Many times in my life I have wondered exactly who I am. There have been times when I felt as though I had little value and wondered if anyone would every love me or want to be with me. Although I always knew my parents loved me, there were times when I felt all alone. Often, I wondered if anyone else ever felt the same way. 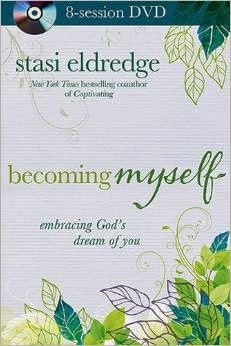 Recently, I was blessed to be chosen to review Becoming Myself, which is a DVD Bible Study. I have been a part of several different Bible studies in the past, and they have all taught me different things. This Bible study actually made me realize that by "Becoming Myself," I am becoming more like Jesus. I have always known that Jesus loves me, but this Bible study reminded me that he loves me now, with all my flaws, even when I do not love myself. Jesus loved me and died for me long before I was ever born. He knew all about me and He knew the life I would live and the struggles I would have. He knew I would want to change things, and myself. The only problem with me changing and becoming myself is that I was trying to do it all by myself, without consulting the Master Creator. This Bible study reminded me that there were a lot of people and things that molded me into who I am now, and with the help of Jesus, I can become the me that God dreamed of! There are 8 sessions in the Becoming Myself Bible study series, and they each are around 15 minutes long. The sessions are thought provoking and are ideal for a small group discussion. I plan to share this Bible study with my women's group at church. This is a powerful study that could benefit every one. I've never tried doing a devotional using a DVD. Did you prefer it to a book version? I think this would be helpful when watching with a friend or family member. We plan to do this one in a few weeks. A smaller group of us, which is good with a study like this where you're discussing your past and some deeper feelings you might have about yourself. Thanks for your thoughts on it!